Do you constantly go through pet beds in your home? In our household, dog beds have a very hard life. Not only do they have to be comfortable and meet our malamutes standards, they have to be able to survive once they decide they want to start biting, shredding, or other naughtiness when the humans aren’t looking. Nothing makes me look in horror more than seeing a $100+ bed ripped to shreds, with stuffing spread comically throughout my living room. Yes, we have been there, done that. After losing a few beds, I decided it was time to try looking for a bed that wasn’t just comfortable for our girls, but would be able to outlast the curiosity and roughness. 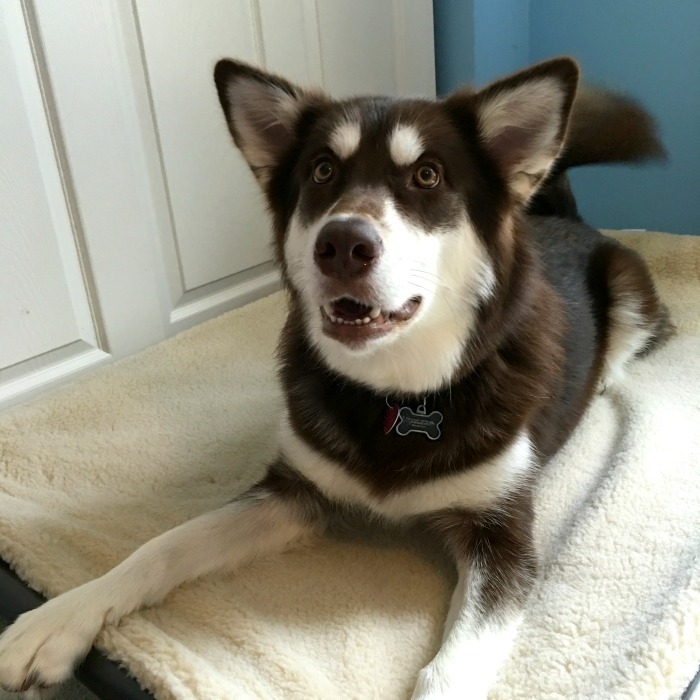 To my delight, we recently found the perfect solution – Kuranda Dog Beds. When I heard they wanted to send a complimentary bed to Ivi, I couldn’t wait for it to arrive and see if it would get Ivi’s paw of approval! Kuranda Dog Beds: What are They? For those who don’t know Kuranda Dog & Cat Beds, they are known for creating orthopedic, chew-proof dog beds used in hundreds of shelters and rescues across the country. Not only are they fashionable, but super comfortable for pets, many times more accommodating for pets than even human furniture and much better than sleeping on a cold floor. They are even recommended by veterinarians because they are so comfortable and keep dogs elevated off the floor, giving them a comfortable, safe area to sleep. Best of all, these beds are for dogs of all sizes, allowing even big dogs (like our Alaskan Malamutes) a chance to put up their paws and relax with their favorite toys without ever leaving their humans. Having been throughout quite a few beds over the years, the thought of a bed designed to handle roughhousing Alaskan Malamutes sounded amazing to me. Even more, having a bed that wouldn’t just last months, but years! Seeing that other Alaskan Malamute owners had used one bed for over 7 years gave me hope that we may have a bed to survive Ivi. When the bed arrived the first thing I had to do was assemble the bed itself. Since I am not a very handy person (I had to ask my husband what an adjustable wrench was from the instructions), it took me about an hour and a half to put together the entire bed. For someone who is handier than me or has a second pair of hands, it would probably be a lot less, especially since you only need two tools (a wrench and screwdriver). Once the bed was together though, the true magic happened. I expected we would have to get Ivi adjusted to the bed (she isn’t usually a fan of anything off the ground), so I had treats in hand ready to go. Instead, she immediately jumped on the bed, played, and then flopped on it, giving us the happiest wags after her experiment. The only problem we have had with the bed itself is that Ivi doesn’t really want the puppy on her bed, though a toy exchange seemed to buy Rylie some permission to get up as well. I am expecting that by the time our newest girl finishes growing, though, we may have to upgrade to the aluminum frame to handle their combined weight. For now, I have a very happy Ivi and am glad that she is on something more comfortable and protective than the floor. Based on our own experience, I am delighted to give the Kuranda Standard Dog Bed an A+ rating and recommend it to any dog owner! Want to purchase one of these awesome beds for your own dog or even cat? You can buy the Kuranda Standard Dog Bed, featured in this review, for $58.95 – $134.95, depending on size. They also offer free shipping on these hard to destroy beds. Head over to Kuranda today to check them out for yourself! What a great invention. Im sure the dogs find them comfortable. I have heard these are great beds and am seeing more an more shelter (good ones anyway) using them. This would relieve pressure sores on older dogs! These are really nice bed, they look so comfy! What I like the most is that they are not laying on the cold floor. I need to get this for my dog, then maybe she wouldn’t sleep on the couch. That does look like a great bed. Lasting for years? Hooray! Looks like a great bed! Our dogs keeping chewing their beds to bits. We desperately need to find something they won’t eat! A great looking bed too! It must be warmer off the floor. Looks like a very comfortable bed. Photos are prroof! My dog has been needing a new dog bed! I will have to check this out! Those look like wonderful dog beds. I like that they’re off the ground. During the Winter- this would be much warmer for my dog. Finally! I was just checking out the damage my dogs have done to thier current ortho bed, you would think we house Tasmanian devils!! I’m looking forward to a bed that can stand the test, thanks for the review!! I like that it gets the dogs off the floor and is comfy. I love the size of this bed, its so hard to find a good bed for your dog that actually gives them room, and love that its off the ground also. This are actually a great price! My dog is getting older with more aches and pains. I love that this is an orthopedic bed to help him sleep more soundly and comfortable. My dog deserves a nice bed! I think its worth investing in a good bed like this to guard against health problems when they get older. Theses look great! We have a rescue shepherd and an AKC Great Dane. We have gone through so many beds! It is ridiculous! I’m going to look into these for sure! I bought one of these beds about three months ago. I have 5 older Chi’s that need the support. They use it all day everyday. They love theirs. My dog and cats would love this! They like to sleep anywhere other than the floor, so this would be perfect for them! My dog sleeps on MY bean bag and the cats sleep on him! Our two dogs need a new bed. This looks like a nice option. Our youngest dog keeps chewing up the beds we get for him. This looks like it might be durable enough to withstand his gnawing! These look like they’re at a great height so our older dog would have no problem getting in the bed. Ivi looks so proud of the bed. It’s going to be super comfy and cozy come the cold months. These do look excellent and also attractive. I don’t like the dog beds made out of calico etc. And more importantly, the doggies sure love these!